The newest kit to our treatment line.. and a MUST have for your skin! This coconut butter-cream frosting is sinfully addictive! It is love at first sniff. The scent is intoxicating and truly delicious! We are so in love! It is a true creamy coconut frosting scent with a hint of caramelized sugar. Truly yummy treatment! 12 oz – Coconut Butter-cream Frosting Bath Candy Sprinkles: Blended with coconut milk powder and coconut oils. 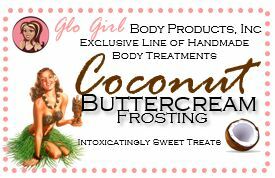 10 oz – Coconut Buttercream Frosting Sugar Baby Body Scrub; blended with coconut milk, shredded coconut, coconut oils and creamy Shea butter. The new coconut buttercream fragrance is simply sinfully addictive! It is love at first sniff. The scent is intoxicating and truly delicious!,,,,,, I am so in love! It is a true buttery coconut scent with a caramelized sugar twist. It is long lasting as i can still smell it hours after application, I sincerely hope that Jaqua adds more to this coconut buttercream line.